He might be the greatest Batman villain of all time. But, what attracts us to the frizzy hair, poor makeup and purple vest? He’s the King of Crime. Batman’s brainy foil. Anarchy personified. The Joker – who hasn’t heard his name before? Everyone recognizes the whitewashed face, outstretched smile and bright red lips. But, why? 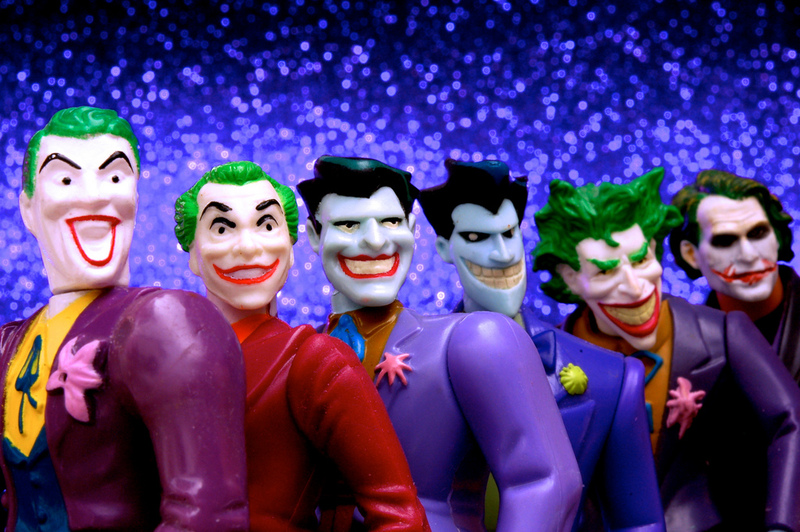 What makes the Joker so iconic? Why do both general audiences and geeks recognize his filthy green hair? As always, psychology lights the way. Before we start analyzing the Joker, let’s establish what he’s not. The King of Crime is not insane. The Diagnostic and Statistical Manual of Mental Disorders (DSM) does not list insanity as a disorder. Insanity is such a broad term, it’d be hard to pin down one definition of it. In a court of law, an “insane” defendant is one who fails to see the difference between right and wrong. Without the scientific method, that’s hardly…scientific. Many people confuse insanity with psychosis. Hallucinations, delusion and incoherent speech are hardly the traits of a master criminal. In The Dark Knight, the Joker taunted, “Do I look like a guy with a plan?” And yet, the Clown Prince of Gotham was ahead of Batman for the entire movie. “I just want my phone call,” he asked before blowing up a police precinct. And what about Tim Burton’s Batman? The Joker developed and shipped tainted beauty products to kill Gotham citizens. Both examples aren’t the results of someone who’s jumbled and confused. Contrary to his words, the Joker always had a plan – like clockwork. So, if the Joker isn’t “insane” or psychotic, what is he? “Mad Love,” an episode in The New Batman Adventures, shows the Joker as a psychopath. He manipulated Arkham Asylum worker Harleen Quinzel into believing he wasn’t mentally unstable. The Joker told her lies about his abusive father who allegedly broke his nose after a visit to the circus. For Harleen (or Harley Quinn), Batman became the bad guy who tortured a “lost soul.” Afterwards, Harley helped the egotistical Joker escape from Arkham. In turn, he emotionally and physically abused her; after she single-handedly caught Batman, he kicked her out of a window. No empathy and no remorse. And what about his antisocial personality disorder? Take the Batman TV show from the 1960’s. The Joker didn’t care about anyone or anything. His methods disregarded others’ safety or moral codes. Stole a Renaissance art collection? Done. Tracked people via small satellites? Yep. Planted a bomb in the Batmobile to kill Batman and Robin? You bet. Impulsivity and dysfunctional behavior accuse the Joker of ASPD. But, why do we relate to the Joker? After all, his fans aren’t psychopaths. We don’t find pleasure in senseless violence and hate. Why do we keep coming back to the Joker? The Clown Prince of Crime seems to have one goal. In The Dark Knight, he described himself as an “agent of chaos.” The Joker wanted to tear down our illusory superiority – our inflated sense of integrity. We know that we’re good people. I was right to yell at a sibling because he was doing something stupid. If you honked at a slow driver on the road, it was because they were incompetent and selfish. No other alternative fits our self-perceived righteousness. Psychologist Carl Jung discovered the human shadow. It’s the negative side of our personalities that, if left unchecked, will take control of us. The Joker is our shadow. He reflects the cowardice, selfishness and primal instincts that want to rule us. Given the opportunity, we’ll “eat each other.” We love the Joker because the Joker is us – a reminder of our corrupt natures. Our next Joker will be Academy Award-winner Joaquin Phoenix. Given the range of actors that have played the King of Crime, it’ll be interesting to see a new take on this iconic villain (anyone is better than Jared Leto, amiright?). How will Phoenix portray psychopathy? Like Ledger, will he tear down our pompous egos? Phoenix, who’s starred in Her, The Master and Gladiator, will bring the Joker back into the spotlight. In a country that’s morally and culturally split, it’s time to wake up and smell the coffee. The Joker won’t solve “America,” but he might make us realize the violent abyss we’re edging towards. The Clown Prince of Crime, the laughing psychopath, the “agent of chaos” – you’re our only hope. Save us from ourselves. Next articleIs Mental Health a Laughing Matter? Theodore Karabet is San Francisco native currently studying International Public Relations at UNC Charlotte. In his spare time, he likes slow-burning indie films, tending to his family's goats, and spending late nights with friends at French bakeries.